January 11, 2016 – After a holiday season of heavy meals and hearty indulgences (pie for the win! ), lightening up by bringing seafood to your dinner table can be just the ticket. Seafood is low in calories compared to other protein-rich foods, and is a good source of vitamins, minerals and omega-3 fatty acids, too. 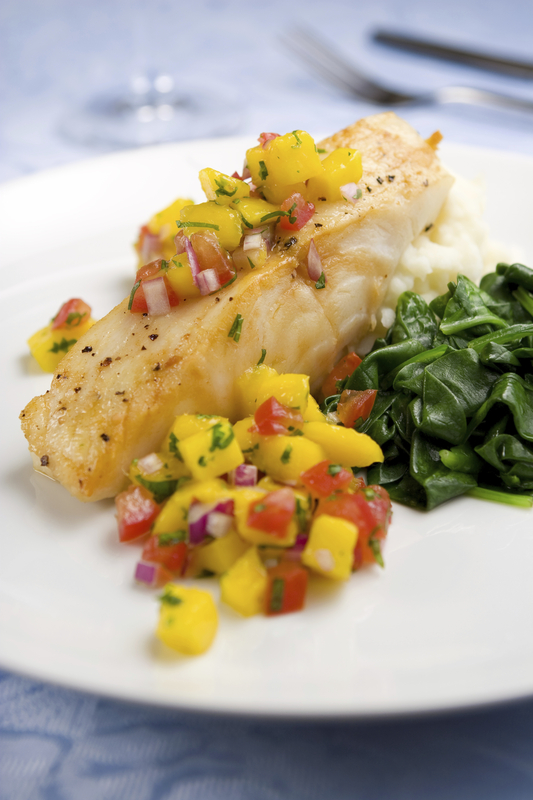 A delicious accompaniment to white fish such as tilapia, pineapple salsa is crisp, tangy and simple to make. Dice up pineapple and add in your favorite salsa fixings, such as cilantro, bell pepper or onion. This sweet salsa is the ideal pairing for grilled salmon. Combine strawberries and finely sliced basil leaves with red wine vinegar, olive oil or honey. Perfect with heartier fish like halibut or salmon, avocado-mango salsa is both refreshing and colorful. Use lime juice for added zing. Looking for a little more salsa inspiration? Visit http://bit.ly/1HuQeLz for fresh ideas, and tell us in the comments how you’re using salsa in your seafood dishes this year! Fruit doesn’t really belong in salsa. It adds too much sugar that we are supposed to be cutting back on. The new guidelines say we are only supposed to have 10% of our daily calories (200 calories) in the form of added sugars and fruits ADDED to either yogurt that never has fruit in it naturally and salsas that never have fruits in them naturally or ethnically, is ADDED sugar and not desirable. Salsas are a great addition to meats and sea foods but do it in a healthier style without adding high sugar fruits like mangoes and pineapple to them. Is there a way to send blog entries , recipe’s to my email addy? Even the recipe’s on Aldi’s regular site. I have an email dedicated to nothing but cooking and its my go to place. Too bad I can’t seem to find a way to send this blog on seafood and salsas!! Cannot findCrab Meat Avocado recipe shown in Jan 2016 Feel Good Food publication. Hi Maxine, you can find that recipe here: http://bit.ly/1SfOttO. We hope you enjoy it!